Canada's Billy Talent sell out arenas and headline major festivals on home soil, and effortlessly engaged 75,000 people at Germany's Rock Am Ring in 2007 as evidenced by the YouTube footage of the sing-along to "Fallen Leaves", but America has some catching up to do. The intense rock band has toured the U.S. before and is currently on tour with Rise Against and Rancid, which began July 6 in Seattle, Wash. and ends July 30 in Hamburg, N.Y. The physical full-length CD, Billy Talent III, produced by Brendan O'Brien (AC/DC, Pearl Jam, Stone Temple Pilots), will be out September 22. The American single bundle EP is available digitally July 28. 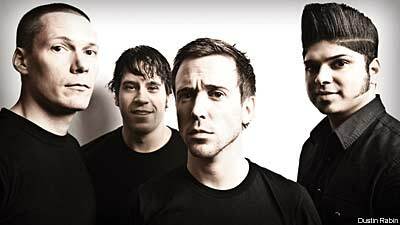 Billy Talent - frontman Ben Kowalewicz, guitarist Ian D'Sa, drummer Aaron Solowoniuk and bassist Jon Gallant - have released two previous albums in the U.S., 2003's self-titled debut and 2006's Billy Talent II. Both were on Atlantic Records, which had a joint venture with Warner Music Canada, but the band just switched to Roadrunner for the U.S. and will be on Warner Music everywhere else. "I think the one thing with us is that our expectations are so low now in America," Kowalewicz laughs, "that if anyone does anything, we're going to be really happy with it. "But we have to say, the fans that do come to our shows, the shows are great and people have so much fun. We love the support we get. And I think because we've had some success in Canada and some places in Europe, [it] shows us that hopefully people will like it, if we keep going back and playing. So it's good to have America still to [break]; we have a lot more people who we can introduce ourselves to. "I think that we've done really well for ourselves in the States and hopefully it will just get bigger and better."